The gvSIG Desktop 2.2 version has a new editing extension with several improvements and new tools respecting the previous version (like the extend line to object or trim line by object tools). One of the changes made at this new extension is the reference to object or snapping option. Like in the previous versions, it’s still available to elements of the same layer as well as to other vector layers that we have at the View. It makes the digitalization of new elements easy. At this window, the type of snapping can be configured (end point, closest point…), and the tolerance in pixels that allows us to approach or move away from the different points of the line with the mouse, and to be recognized. 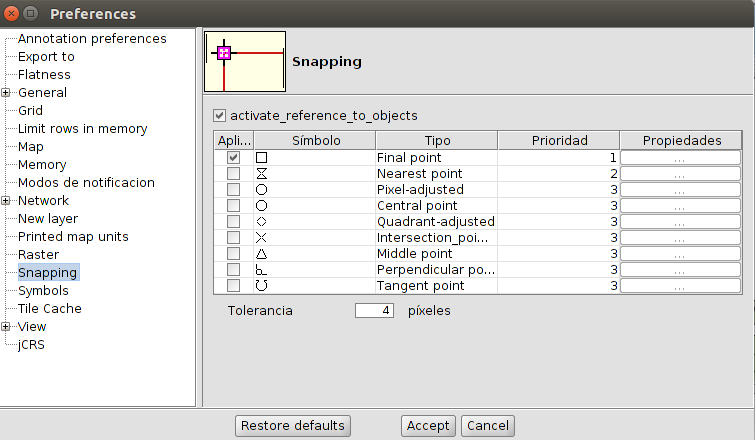 If the “Snap tolerance” is 4 pixels, two elements which are the same distance or closer than 4 pixels will be joined in a common coordinate. Here we can activate or deactivate snapping for every view in our project, and define the priority of every type, the order that we prefer it’s detected. At this window the vector layers of our view can be selected to be used for snapping. The tolerance for that view can be selected too (the tolerance by default will be the selected at the Settings menu, and here we can change it only for that view). 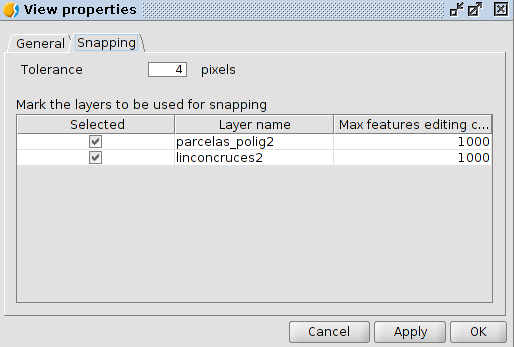 Another configuration possibility is to select the maximum number of features to keep in memory, in order to accelerate the snapping in editing mode. It’s the maximum number of entities that we want to have in memory in our computer. This option is at the View properties now (View->Properties menu, Snapping tab). This entry was posted in english, gvSIG Desktop and tagged editing, snapping. Bookmark the permalink.